In the final decade of the 17th century, composer Francesco Antonio Pistocchi (16591726) enjoyed international acclaim as a countertenor, particularly in the performance of his own works. 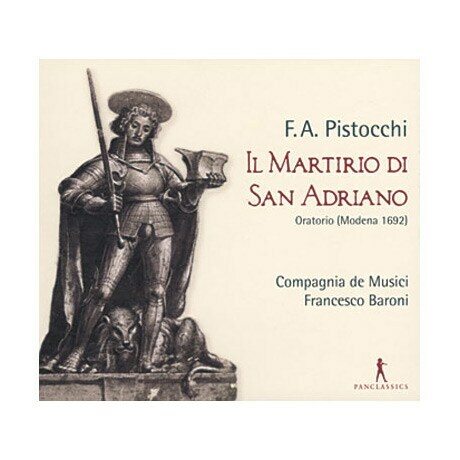 Pistocchi sang the part of Adrian in the 1692 debut of his masterful Il Martirio di San Adriano ("The Martyrdom of St. Adrian"), an oratorio for four voices composed to honor a duke's wedding. In this beautiful 2012 recording by an all-Italian cast of baroque specialists, alto Alessandro Carmigiani performs the role of the third-century AD Roman officer who accepted the emperor's death sentence rather than renounce his faith.